The Bowdoinham Farmers’ Market’s mission is to create a venue where can people obtain fresh, local products and support our local economy. 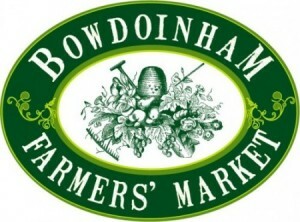 The Bowdoinham Farmers’ Market is held May through October on Saturdays from 8:30am-12:30pm at the Mailly Waterfront Park, 6 Main St, Bowdoinham. Products change based on seasonality and include: Organic vegetables, vegetables, strawberries, raspberries, blueberries, dried beans, pastured beef, pastured lamb, free range eggs, wool fiber products, hanging baskets, annuals, flower seedlings, herbs, baked goods, vinegars, jams, salsas, cornmeal and beautiful craft items. The Sprouts Table will feature our town’s young entrepreneurs, with a variety of goods made with Maine ingredients. In the past shoppers have enjoyed sticky buns, pies, scones, and jumbo healthy breakfast muffins. Visit the market’s Facebook page for more information!